Think Clark Gregg has been playing a mild-mannered guy in a suit? Think again! 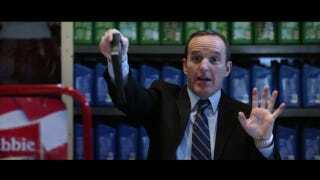 Watch as Agent Coulson unleashes the beast within, in his latest Marvel short movie. We cannot wait for the day when Agent Coulson's origin story is revealed. Officially titled, ""A Funny Thing Happened on the Way to Thor's Hammer," the short premiered on the Captain America DVD.